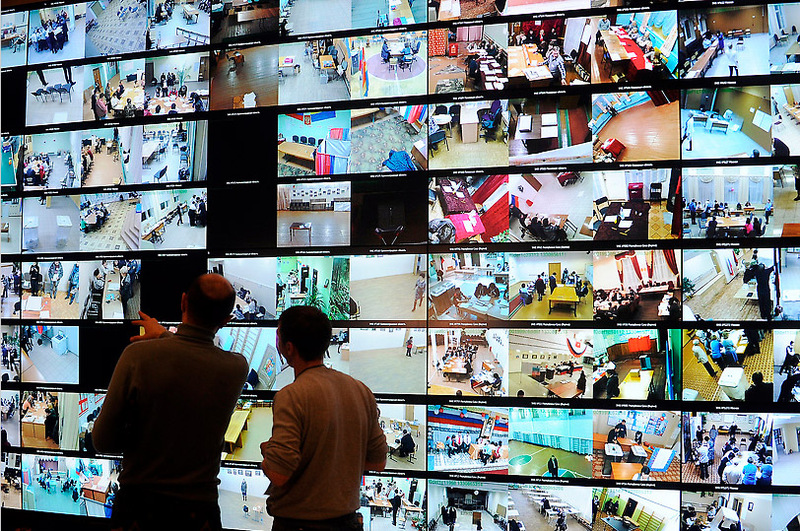 Why did the Russian Government Install Webcams in Polling Stations? It may seem puzzling that Russian government spent 300 million dollars installing webcams in every polling station for the presidential election this past week. As mentioned in a Monkey Cage post back before the election, I have a theoretical paper that seeks to explain why governments voluntarily invite international election monitors, which can easily be adapted to this question. In short, installing webcams can serve as a very visible mechanism to make certain types of fraud more visible/difficult. So, for a fixed election result, the government will seem more popular when there are monitors and webcams, while spending less effort to commit fraud. The paper is here, below is a short summary of the logic of the formal model and how it applies to webcams. Committing fraud to seem more popular is not cheap: poll workers have to be bought off, voters have to be bused from one polling station to the next, etc. Further, a problem facing Putin and others in his situation is that the domestic audience they are trying to impress are aware that these activities are going on. They may over- or under-estimate how much fraud takes place, but for simplicity suppose they form a correct conjecture of how much cheating there is. If so, the incumbent regime spends lots of money and effort to cheat without convincing anyone that they are actually strong. If it doesn’t work, why commit the fraud? In the model, this happens because how much fraud they commit is only partially observed. So, if they falsify fewer votes than their audience conjectures, they will seem weaker and more unpopular than they really are. Conversely, there is always a benefit to committing a bit more fraud than expected. Loosely speaking, for the equilibrium amount of fraud to be 15%, it must be the case that the marginal benefit of being seen as 1% more popular is equal to the marginal cost of going from falsifying 15% to 16% of the vote. This may not be true at 15%, but the model demonstrates some conditions under which there is some nonzero amount of fraud where the marginal benefit meets the marginal cost. Now suppose there are lots of international monitors present and/or webcams in every polling station. This makes fraud more visible, and hence makes it more difficult to seem more popular by committing more fraud than expected. This leads to a lower equilibrium level of fraud—-and hence cost paid to commit the fraud—-but does not affect how popular and strong the leader ends up seeming. So, inviting monitoring, in the form of the OSCE or installing webcams, can unambiguously leave the leader better off. As with any model, this likely does not tell the whole story of why webcams were used in Azerbaijan or Russia. As suggested by Josh, webcams may lead local officials to commit fraud in less embarrassing ways. In addition, having eyes on the polling station can help national party officials figure out which of the local party agents are particularly good at generating favorable results without cheating (or who is particularly good at cheating without getting caught!). Still, I think the effects described above at least render the decision to install webcams less surprising.